Re-building the way we view and enjoy live music and music videos, Bongo Boy Records have put together Rock and Roll TV – the perfect place to check out a consistent stream of new and upcoming music ranging from blues rock to reggae to good old fashioned rock and roll and beyond. Episode 11 is featured below and kicks off with a live scene from New Jersey’s Wayne Olivieri as he and his band pour through with Music Man. Olivieri offers gritty and soulful rock vocals and a stage presence that suits the warmth and hit of the song in a genuine way. ash.OK follow the opener with their stunning video for the song Holding Sand. The Philadelphia-based band present a delicate instrumental journey through mild rhythms and dreamlike riffs. Celtic-style strings and keys combine, a distant beat – an overwhelming sense of melancholy pours through from the beautiful musicality and the visuals combined. Arrangement-wise this episode is impossible to predict, making it all the more interesting and appealing from a viewer / listener perspective. Godson of Sellasia (Feat.DJ K-LA) by Maryland’s STEEL throws another fork in the road and redirects the mood in something of a mellow reggae direction with flickers of other genres and cultures intertwined. The song has a smooth RnB vibe but there are dashes of electric guitar in the distance and the structure leans in a more creatively free direction. niMO & The Light reignite the indie-rock flame and emerge with a rather iconic video for their single Skin To Skin. The Brooklyn-based band offer a heartfelt song that speaks out in a vulnerable, honest manner. The delicacy of the leading voice has a classic and genuine feel, the weight of the music contrasts increasingly with this, there’s even a hint of Americana to the guitar sound. The song has a beautiful hook, equally gentle but high enough to stand out and draw you in. There’s a sudden uplifting warmth at this moment. A hauntingly thoughtful aura comes through as Kristy Chmura’s video for Abandoned House hits the mix. The melody and the lyrics, as well as the artist’s delivery of these, appear with a consistently interesting nature. The ideas are poetic and compelling, honest yet again – this indie playlist in full feels very genuine. From a songwriting perspective this is stunning, gorgeously performed and melodically superior to the vast majority of simpler gentle releases. The structure and the set-up compliment the central sentiments in a wonderful way. A definite highlight in terms of intrigue and originality. Don’t Think Just Breathe by Couch Jackets brings back the upbeat energy of indie-rock and drives with a gritty, gravelly vocal and some immediately uplifting, beautifully chaotic instrumentation. The concept again appeals for its realness and its refreshing approach to an accessible subject matter. The song gets increasingly creative as it progresses, making you fall in love with the band even more so. A great song, easy to listen to on repeat and a band worth looking out for on the live scene. The one and only Les Fradkin finishes this episode up with a real-time clip for his single Wave Rider. The Colorado artist drives with passionate guitar playing and does so in an artistic way – meeting the needs of the moment, creating that metaphorical wave for the listener to ride upon, and making for an easy to enjoy final section of the show. Rather than seeking out track after track or relying upon playlists that randomly mix, Bongo Boy Records make discovering new music easy with their new take on music television. 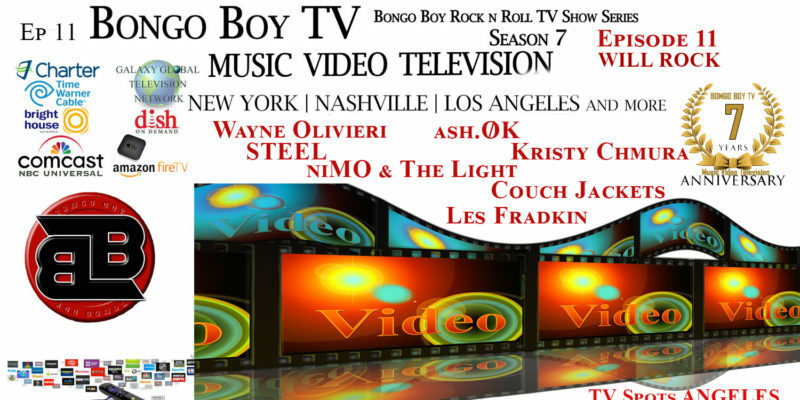 Visit the Bongo Boy Records Website for more information or check out the TV Guide here.